As the laps wore on and Dale Earnhardt Jr.’s No. 88 car kept running up front Friday night at Richmond Raceway, a familiar and unpleasant feeling began to come over him. Pressure and stress were two sensations that robbed Earnhardt of so much joy in his racing career. And in his one-off return to NASCAR — fulfilling a sponsor commitment that helped his team survive — he wanted nothing to do with those feelings. This was supposed to be carefree and fun, the opportunity to get out there one more time and even take a picture with newborn daughter Isla at his car before the race. A top-10 finish would certainly be enough to satisfy him, Earnhardt figured. But as the competitive side took over and he realized he might actually win the race — he led a race-high 96 laps, after all — that happiness threatened to disappear. As it turned out, Earnhardt didn’t win; a caution with 30 laps to go took away what seemed like a sure victory. One bad restart on the outside lane later, and he had to settle for a fourth-place finish. But damn if he didn’t enjoy it. There was a true sense of glee behind his smile Friday night. He didn’t just get out on the Richmond track, survive and make laps. Earnhardt proved to himself he still had his driving tools — even the peripheral vision and sense of where the other cars were, which he worried would be gone after a long layoff. “The sport is elite, the drivers are elite,” he said. “This ain’t a hobby. You just can’t assume you’re going to miss eight months or 10 months and come right in here and win or run in the top five. But he did, and he also had enough fun to try it again sometime next year — perhaps again at Richmond or even Atlanta, he said. There’s just one catch: He wants to make sure his new job at NBC Sports is always the priority. And he felt a step behind with broadcasting on Friday because he was so focused on his own racing. Steve Letarte probably could have written an entire book about leadership, motivation and team-building. But armed with a compelling story — his years as Dale Earnhardt Jr.’s crew chief — Letarte and co-author Nate Ryan smoothy weave in leadership lessons instead of hitting readers over the head with them. Letarte’s new book, Leading the Way, allows readers to go through his experiences and learn what to do — or what not to do — right along with him. The crew-chief-turned-TV-analyst doesn’t try to make it out like everything he did was perfect. Quite the opposite, actually. He’s blunt about his missteps, but uses each one as even more of a lesson than the successes. Business leaders — or those who attend Letarte’s speaking engagements — would find the book valuable. But it will also appeal to NASCAR fans (not just Junior Nation) because it provides insight into the inner workings of a race team. The book is a quick read — just over 130 pages — and you could probably go through it in a couple sittings. However, I found myself stopping at the end of several chapters to think about the examples Letarte had just put forward and wondering how I could apply it to my own life. Leading the Way never seems to get bogged down. Ryan, the “as told to” author who essentially took Letarte’s own words and put them in order, makes sure passages and transitions flow while expertly retaining Letarte’s voice. You can practically hear Letarte reading the words aloud, which likely is the whole point. 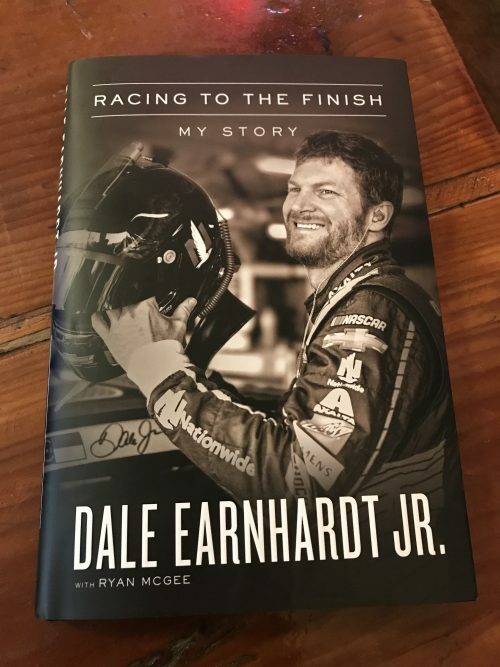 Notification of bias: Nate Ryan is one of my good friends and I like Steve Letarte a lot, so I already wanted to like the book before I read it. But I genuinely enjoyed it. Those stand-up-and-scream-at-the-TV finishes have been all too rare lately, especially in this predictable and oft-dry season. But Chicago was a reminder of why so many of us invest our time watching NASCAR. The payoff for those who tuned in for the race was very high, and viewers got rewarded with one of the best finishes in a long time. When you get a race with lead changes and passing and contact and drama on the final lap, that’s thrilling enough. But when it happens on a 1.5-mile track, it’s oddly even more of an adrenaline rush than on a short track — because you don’t really expect it. Are we going to see this every week? No, of course not. That’s why a bunch of important people wanted the All-Star package to be used in Cup. So let’s just be appreciative and thankful for seeing a good intermediate track race — and getting the reminder they do exist and can put on an outstanding show under the right circumstances. Kyle Busch’s aggressive bump of Kyle Larson was 100% fair game. Larson said as much in his classy interview after the race, but that won’t keep some people from loathing Busch even more now (I’ve already seen this in my Twitter mentions). Had it been a driver other than Busch, fans would have been cheering like crazy during his postrace interview. Can you imagine if Tony Stewart had done that? People would have said it was one of the coolest things ever. Instead, fans showered Busch with boos and jeers. But at least that made him turn to the camera and do the crying face acting, which was hilarious and instantly meme-worthy. Seriously though, Larson hit Busch in a last-lap battle for the win. You don’t think it’s fair game for Busch to nail him back? C’mon. That’s just silly. That’s pure NASCAR right there, and it’s what distinguishes stock cars from the other forms of racing. This has been the season of Busch, Kevin Harvick and Martin Truex Jr. — a whopping 13 wins in 17 races between them! INSANE! So the fact Larson has even been a factor in some of these races is super impressive. He arguably doesn’t have as good of a car as the Big Three and yet can battle with them anyway. Imagine if he was driving a Stewart-Haas Racing car! Additionally, his racer mentality is a really cool part of his personality and story. Did you expect him to get out of the car and rip Busch for being dirty, or perhaps whine or make a sarcastic personal comment? He didn’t do any of that. In fact, he did the opposite. He essentially let Busch off the hook and took the high road, then even went to victory lane to congratulate the winning driver! That certainly raised Larson’s respect level in a lot of fans’ eyes. Look, it’s fun when drivers get angry and punch each other after the race. You can get good videos of that and post them to YouTube, and lots of people will watch. But it’s also neat to see competitors go all-out during the race and then treat each other respectfully afterward. It’s not like Larson was OK with losing, but he knew what happened was just part of racing — so he didn’t pout about it. Apparently there was a new broadcaster in the NBCSN booth. I’m having trouble coming up with the name. Let me watch the replay of the finish real quick. Oh yeah — SLIDE JOB! Dale Earnhardt Jr.’s debut for NBC was refreshing and interesting. He had some good lines (“It’s like driving off a set of stairs,” he said of the Chicago bumps) and shared solid insight (“It does feel good, but it’s early,” Earnhardt said of Aric Almirola, pumping the brakes early in Stage 2 when the rest of the booth was getting excited). But the best part was Earnhardt’s genuine enthusiasm for what he was seeing. There was nothing forced or fake; he wasn’t trying to sell anything to the viewers or convince people it was a good race — he was simply passing along his passion (or hitting Steve Letarte in the shoulder). It felt more like you were watching the race with a buddy rather than being talked down to by a professional broadcaster. That said, I’m worried people are setting Earnhardt up for failure. NBC promoted the crap out of his debut, and everything leading up to the race was all about the guy in the booth — not anything to do with the cars or current drivers. So the expectations for what Earnhardt can bring to the broadcasts is very, very high. That’s unreasonable. No matter who the broadcaster is, people aren’t going to tune in on a large-scale basis just to hear someone talk. I mean, the ratings didn’t even go up for Earnhardt’s final race last season at Homestead (they actually went down 20% and had a decline of 1.4 million viewers over the previous year)! So how can Earnhardt be expected to stop NASCAR’s ratings slide just by his presence as a broadcaster? Everyone should just let Dale be Dale. Appreciate his insight and voice in the booth, which will fit seamlessly into the NBC broadcasts. But don’t expect he’s going to save the sport at this point. No one individual can do that. With nine weeks to go in the regular season, there are still a whopping 10 spots available to make the playoffs on points. Brad Keselowski is the current leader among those who haven’t won yet, followed by Kurt Busch, Denny Hamlin, Kyle Larson and Ryan Blaney. Aric Almirola is also comfortably inside the playoffs at this time. The cutoff right now is Alex Bowman. Those above him in points are Jimmie Johnson (+52), Chase Elliott (+45) and Erik Jones (+18). Those on the outside are Ricky Stenhouse Jr. (-23) and Paul Menard (-28). Daniel Suarez is the next-closest, but he’s pretty far out of it (-74 points). Next week is Daytona, which represents an opportunity for someone like a Jamie McMurray or Bubba Wallace to steal an unexpected playoff spot.